The path to healthy body, and happy soul is based upon self-study,mindfulness, love and awareness. Understanding our relationship to eating cultivates a lot of insights and help us start living our highest potential. Create a daily routine that will inspire your body health, your mind and your spiritual development. Eat at set times. Avoid snacking. Share your food with someone. It is more fun. We do food every day so you can try, practice and re-experience mindfulness eating exercises, and work with your willpower, and food awareness every single day. Become ‘mindful’ of your food. Your enjoyment will multiply and fulfillment will soon follow. Decorate your plate and enjoy the process of preparation. Experiment with new items, experiment with colours. Just before you take your first bite, sit in front of your food in a prayer. With this act you respect the food, the space around you, the people that made this food, and the silence. The meditation will make you face your animal instinct of HUNGER. Relax and enjoy the experience, enjoy the moment, be mindful of all around you and turn towards your food in peace. Eat slowly,lift your fork gradually and thoughtfully, and experience every movement fully. Chew your food properly. Try chewing for 30sec or 1min a bite. Be aware of your instinct to swallow. After finishing your meal, allow the feeling of gratitude to fill your mind. This wonderful nourishing meal is here to support you on your further journey. Practicing mindful eating exercises, you will notice that the quality of food will replace the quantity, and that the awareness will become your guide and protector. With the awareness you will start respecting yourself. Bring the awareness into your drinking and eating habits. Prepare and drink your coffee with mindfulness. The Coffee Ritual is an ancient ritual coming from Africa. Coffee needs to be roasted, ground and freshly prepared. Buy the best quality organic fair-trade coffee. Prepare your coffee adding spices to it. My favourite spices are: cardamom, cinnemon, coriander. To sweeten you can use: carob, agave syrup or honey. Prepare your perfect cup of coffee mindfully and enjoy its taste fully. I also love to put into my coffee a drop of coconut oil. How to prepare Turkish Coffee in a Traditional Way. Cezve or Ibrik is a Turkish name for a traditional coffee-cooking pot made from copper loved throughout the Middle East. To make a Turkish cup of coffee you start with a very fine grind. This coffee is enjoyed in very small cups. Boil coffee waiting for the mixture to start rising. Remove the coffee pot from the heat immediately after the first boil. Allow remaining coffee powder to settle before serving into the cups. When you cook the Turkish Coffee be prepared that there will be some remaining coffee powder settled at the bottom of your cup. If your cups are white you can turn them around and read your destiny from the figures that are drawn within the mozaic of fine grid coffee. Remember: Less processed the coffee, better is the end results. Coffee is a source of antioxidants but one a day is just perfect. It is our pleasure to launch our new Alchemy of Love Mindfulness Training book! 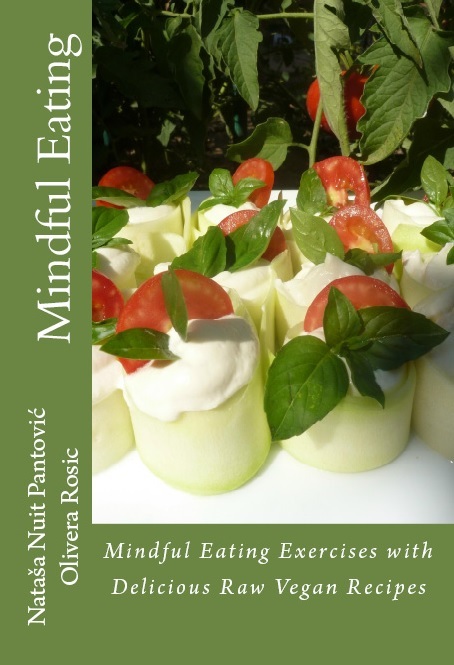 The mindful eating exercises within the Alchemy of Love Mindfulness Training Book: Mindful Eating are designed to help you adopt healthy nutritional habits that empower your physical body. The mindfulness eating exercises will help you prioritise and enjoy food more. The book is designed with some delicious raw vegan recipes. Our experienced vegan chef Olivera Rosic adores experimenting and creating the most appetizing vegan dishes, delicious freshly squeezed juices and rich chocolate creams with raw coco. Her mind is always full of little cooking secrets of how to create adish that is truly unique. 10 miracle foods, fruits and veggies best for your nutrition. How to stay healthy tips!